A scene is a graphical user-interface consisting of a collection of elements to which tasks can be attached to be run when the user interacts with them e.g. by tapping them. 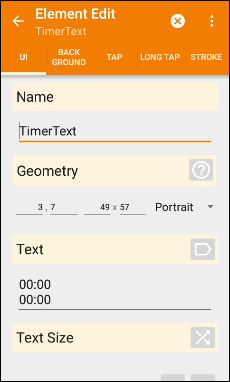 Tasker uses scenes for things like popup dialogs, menus and getting input from the user but scenes can actually be displayed by the user whenever desired, meaning they can be used for things like creating simple user-designed applications or showing extra controls over the top of (selected) existing applications. Scenes are completely user-customisable via a drag-and-drop graphical editor. These actions use a built-in scene with the same name as their action. After creating a task with such an action, the associated scene can be found under the Scenes tab on the main Tasker screen. That scene can be edited so that e.g. all Popup actions have the same style because they all use the same scene. The parameters specified in the action are applied to the scene before it is show. For instance, if the scene has a Title element it will be set to the title specified in the action and the scene resized appropriately. in a Popup action, specify that the cloned scene should be used by clicking on the Layout parameter in the action edit screen. These allow a completely free hand over when a scene should be displayed and it's life-cycle. They all act on scenes pre-designed in the Scenes tab. Each scene is comprised of a number of elements. It's size and position on the screen. An element's geometry is specified in the scene editor. How it looks on the screen. Specified under the UI tab in the element editor. Some elements also have a Background tab. A Menu element has an additional Items tab. What should happen when the user interacts with the element. Specified under the right-most tabs after clicking on the element in the element editor. There are different events depending on the type of element. For instance, a Button has tap and long-tap events while a Slider has a value-set event. Local variables set by event tasks are visible to all tasks in the same scene. In the Scenes action category, there are several actions for setting the properties of scene elements. You can use these for a wide variety of purposes e.g. Note that actions that affect scene elements can only be used when the scene has already been created (via Create Scene or Show Scene). The scene does not have to be visible. The latter two are visual edit, and can be controlled more detailed in the Geometry fields in scene property and scene element. Although they share the name "Geometry", they has different meanings. In scene property, the geometry is the width and height of the scene, not the position of the scene in the screen. In scene element, geometry is the position of the element INSIDE the scene. Tasker scenes can be defined differently for landscape and portrait orientation. In most cases for small scenes this makes no sense and is double the work to do. 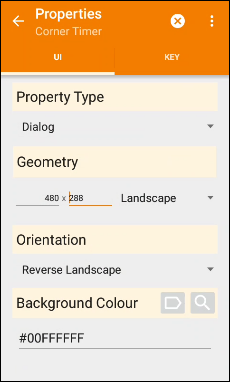 Therefore you may want to set orientation to portrait everywhere - this makes Tasker always show the portrait version of the scene regardless of the mobile/display orientation.